County Commissioners sign approval for bids presented by Scott Tilden. 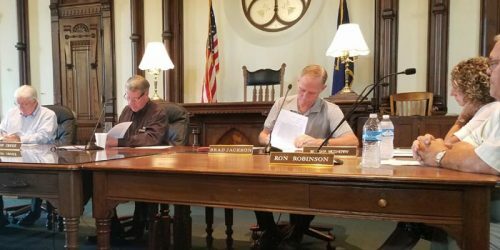 WARSAW — The Kosciusko County Commissioners met for a short meeting Tuesday, Sept. 6. The first order of business was presented by County Auditor Michelle Puckett regarding the retirement line item for the fiscal budget for 2017. In the original approved Council budget, there was a reduction in retirement benefits for the Sheriff’s department. After recalculation, the Merit Board suggested that benefits be increased by 1 percent for the 20 to 32 year retirement benefit. Pending approval from Commissioners, Council agreed to adjust the retirement package for county employees. The change results in a $30,000 increase in budget annually. Commissioners approved. The next order of business came from county highway superintendent Scott Tilden who presented a recommendation regarding the previously presented constructions and repaving of County Farm Road between CR 200S and 700S, Old State Road 15 between Levi Lee and Armstrong Road, and CR 350W between U.S. 30 and Old Road 30. The projects are applicable for the $1 million County Crossings Grant that was received. Bids for these projects were opened up on Aug. 23. Tilden recommended that all three projects be awarded to lowest bidder Phend & Brown whose three bids came in under the original estimate. The lower bids mean that the full $1 million grant will not be awarded, but this allows for more money to be applied for next year. County Road bid at $1,098,795.20, Old State Road 15 at $210,798, and CR 350W at $238,949. A timetable for these projects is scheduled to be discussed at the Ft. Wayne District on Sept. 19. Commissioners approved Tilden’s recommendation. Matt Sandy presented an amendment to the sign portion of the Zoning Ordinance altering two major issues. The first being that signs of any kind must be placed 10 feet from any driving surface. The second issue is in regards to new procedures for violations: if there is a violation, the sign will be pulled and disposed of. Formerly signs were kept to be claimed. Sandy made it clear that the state has their own regulations regarding signs within right-of-way lines and have jurisdiction to pull signs they find in violation. The next regular meeting will be at 9 a.m. on Tuesday, Sept. 20.